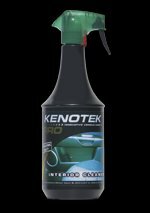 Kenotek Interior Cleaner is a safe, effective and economical interior valeting product with a myriad uses. It thoroughly cleans upholstery, vinyl, plastics, headlinings, carpets and trim, without removing colour from fabrics, and removes stubborn stains. Contents: 1 litre spray bottle. Clear liquid.